There is an historical connection between the Gazan community and the off shore fishery. In recent times some 3000 fishermen in over 700 boats made their livelihood in the waters off the shores of Gaza. Before 1978 when the fishing area included the sea off the Sinai coastline the area covered some 75,000 square kilometers. The larger boats are about 20 meters in length and usually carry a crew of 7. They are typically trawlers using downriggers to lower their nets to the ocean bed. Currently their main catch is bream or sardines that average between 8 and 14 inches. The smallest craft are rowboats normally used to deploy nets a few hundred meters off shore. The nets are then hauled in by hand from the beach. These catches are very modest. After the 1994 GAZA-JERICHO AGREEMENT the fishermen were free to use a corridor extending 20 nautical miles from the Gaza shore bounded by restricted zones to the north and south abutting Israeli and Egyptian waters. After the UN’s 2002 Bertini proposal the approved location was reduced to an area within 12 nautical miles of the coast. More recently the area available has been reduced to 300 square kilometers. In the late 1990’s the British Gas Group (BG Group) discovered a vast deposit of natural gas under the waters off Gaza: Over 1 trillion cubic feet equal to 150 million barrels of oil was estimated to be there. A significantly smaller deposit was also found in nearby Israeli waters. On 11/8/99 Chairman Yasser Arafat signed an agreement giving BG Group 90 percent interest and 10 per cent to Consolidated Contractors Company, an Athens based Palestinian entity connected to the PLO. A final allocation of the rights continues to be contested between BG Group, Israel, Egypt and the Palestinians in obscured ongoing negotiations. The Israelis began their program of killing and harassing the Gazan fishermen only after the discovery of the natural gas deposits. It is a reasonable assumption that the two events are linked: That the Israelis are asserting control over this resource valued at over 4 billion dollars; And that they are intent on denying any benefit to the Palestinians regardless of who controls Gaza. -May 4, 1994: PLO Chairman Yasser Arafat and Israeli Prime Minister Yitzhak Rabin signed The Gaza-Jericho Agreement. Article XI established three Maritime Activity Zones that extended out to sea 20 nautical miles from the coast of Gaza. Two narrow Zones running parallel to the boundaries of Egyptian and Israeli waters were designated No Fishing Areas. Under the terms of the Agreement the larger remaining Zone “will be open for fishing, recreation and economic activities.” The Gazan fishermen operated freely for the next 6 years within this Zone with no major confrontations with the Israelis. – Late 1990’s: The British Gas Group (later BG Group) began explorations off the Israeli and Gazan coasts for natural gas. A modest deposit was found in Israeli waters close to the Gaza Marine Activity Zone. A significantly larger deposit was found in a section of this Zone centered some 10 to 15 nautical miles offshore. It was estimated that there were sufficient reserves to generate electric power for all Palestinian needs for a decade and still have surplus to export. – July 25, 2000: Yasser Arafat walked out on the Camp David meeting. – September 27, 2000: Yasser Arafat traveled 19 miles off the Gaza coast to light the first flare stack flowing from the natural gas. An Israeli oil consortium had contested the Palestinian rights to the gas but was overturned in an Israeli court. The initial agreement with the BG Group gave them 90 percent interest and 10 percent to Consolidated Contractors Company, an Athens based Palestinian group. They and the Palestinian Investment Fund (PIF) had the option to later assume up to 40 per cent interest. Initially BG Group negotiated with Egypt to run an undersea pipeline designed to import the gas. Under pressure from Tony Blair BG Group was forced to negotiate with the Israelis instead. Those discussions, which centered over price, have been so long and contentious that BG Group closed their Israel office and again began dealing with Egypt. – September 28, 2000: Ariel Sharon visited the Temple Mount despite warnings by Arafat and other leading Palestinians. The predictable riots and deaths following this provocation marked the beginning of 2nd Intafada. Sharon was elected Prime Minister in February 2001. He vowed that Israel would never buy gas from the Palestinians. After the outbreak of the 2nd Intafada the Israelis began an ever-tightening blockade of Gaza with fewer and fewer trucks allowed to enter. – Late 2000: Attacks by Israeli patrol boats against Gazan fishing boats began and have continued to this day. These attacks began 5 years before Hamas freely won the legislative elections on January 25, 2006. It is apparent that these assaults on the fishermen had nothing to do with security or with Hamas. Instead it had everything to do with a 4 billion dollar resource belonging to the Palestinians. – August, 2002: In response to a request from Prime Minister Sharon, the Secretary-General of the United Nations appointed Ms. Catherine Bertini as his Personal Humanitarian Envoy to asses humanitarian needs of the Palestinians. At the end of her visit to the area she made numerous recommendations including one that dealt with the fishing boats. In her report she included a list of “Previous Commitments Made by Israel”. Item 2 states: “The fishing zone for Palestinian fishing boats off the Gaza coast is 12 nautical miles. This policy needs to be fully implemented.” But never was! – Although the attacks occurred throughout the Maritime Activity Zone they were more common once a boat had passed the 6-mile limit. Most boats now carry GPS’s in order to know their exact positions. Some captains are intimidated by the Israeli threat and turn back before crossing the line. Others go further despite the increased danger from the Israelis. The fishery closer to shore has collapsed after so many boats were forced to operate in such a limited area. In addition the waters near shore are polluted due to sewage pouring in from broken pipes. One more consequence of an infrastructure crippled by the Israelis. Since the outset of these assaults at least 14 fishermen have been killed and over 200 injured. Boats continue to be damaged or impounded. 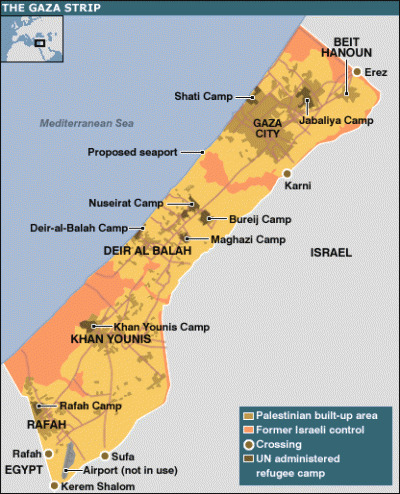 9/12/05 – Israel announced that it had ended the occupation of Gaza and withdrew its forces. It maintained control of land and sea-lanes as well as all border crossings on land. 1/25/06 – Hamas won 76 of 132 seats in the Palestinian Legislative Council in an open honest election. After a bloody battle with Fatah elements Hamas took control of Gaza. Israel and the United States branded Hamas a terrorist organization and have had no public contact with it thereafter. The restrictions at the border crossings were tightened further with severe limitations on the traffic of produce, materials, medicines and people. Anemia and malnutrition were widespread as a result. Early June 2008 – Israeli Defense Minister Ehud Barak instructed the Israel Defense Forces to covertly prepare for an invasion of Gaza to be known as operation “Cast Lead”. June, 2008 -Israel contacted BG Group to propose reopening negotiations over the natural gas deposits. Actual negotiations overseen by Ehud Olmert were taking place in October, 2008. It appears that Israel wished to reach an agreement with BG Group before the secretly planned invasion began. 6/19/08 – Hamas and Israel signed a 6-month truce agreement calling for cessation of rocket firings by Hamas and military incursions by Israel. In May over 300 rockets had been fired. In September only 5 to 10 were fired. Hamas was lead to believe that significant increase in shipments would be allowed to enter Gaza. Before the truce roughly 70 trucks were allowed to bring provisions into Gaza each day compared with some 900 permitted before the Israeli clamp down in 2000. Hamas believed that a similar flow of traffic would be restored. Instead Israel allowed only an increase from the 70 to 90 trucks. 11/5/08 – IDF forces killed 6 Palestinians while supposedly searching for a tunnel passing under the border. In effect the truce was over after this provocation. During the next 5 weeks 237 rockets were fired into Israel compared with the 5 to 10 fired in September. The increase in rocket fire was Israel’s public justification for launching the long planned “Cast Lead” invasion. 11/18/08 – An Egyptian court ordered the government to stop shipping natural gas to Israel. Under a 2005 agreement Egypt agreed to deliver 1.7 billion cubic meters of gas to Israel over a 15-year period. The gas began to flow in May, 2008. A lawsuit followed seeking to bar delivery since the Parliament had not given its approval. The court supported the lawsuit and its findings are being appealed. The potential cutoff of the gas from Egypt gave Israel even more incentive to take control of the Gaza Marine deposits and to deny any benefits to Palestinians whether Hamas or Fatah. 11/18/08 – Israeli naval vessels attacked three Palestinian fishing boats located seven miles off the coast of Deir Al Balah, clearly within the limits permitted in the 1994 Gaza-Jericho Agreement. Fifteen Palestinian fishermen and three international observers were kidnapped and taken with the boats to Israel. The fishermen were held for a day and then released. The boats were eventually returned but damaged. The internationals were jailed in Israel for many days and then deported. 12/27/08 – Israel began bombing Gaza as phase 1 of operation “Cast Lead”. The vast natural gas deposits of Gaza Marine 1 and 2 rest a few miles offshore. To the victor the spoils one more time? Only time and perhaps the conscience of the world will determine. Although the violations of law and basic human rights to the Gazan fishermen pale in comparison to the horrors that have unfolded they should not be forgot or forgiven. Based on the limited reports coming from Gaza due to Israeli restrictions on journalists it is possible that there are no fishing boats left or even a harbor. Perhaps justice will never be served on those who initiated and perpetuated these assaults. But let us never forget that the greed and self-interest embodied in these policies are those of a country that has lost its shame. Has lost its honor. David K. Schermerhorn has traveled on humanitarian missions to Gaza on three separate occasions in recent months aboard Free Gaza (www.freegaza.org) boats. He spent spent two days aboard fishing boats that were harassed by Israeli machine gun fire and assaulted by water cannons.